While the company saw tremendous growth in digital orders last quarter due to its "smarter pickup times" technology, it needs to improve store efficiency to reach a digitally enabled future. 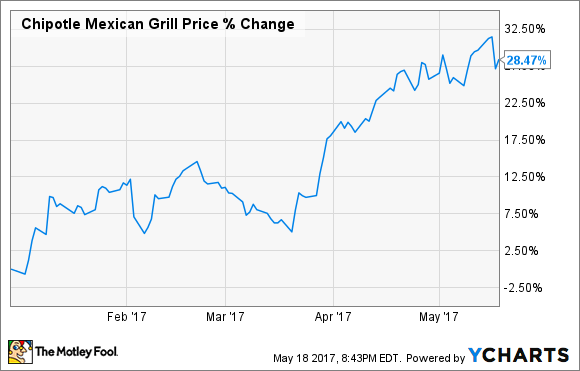 On-the-comeback-trail burrito maker Chipotle Mexican Grill (NYSE:CMG) has seen a positive run for its stock, up 28% so far this year, with a recent bump sparked by first-quarter results that showed surprising growth in digital orders. The digital-ordering record was the result of improvements in pickup times for mobile orders, and of marketing the digital experience. While the initial rollout has had some disappointed customers, Chipotle has plans to improve the efficiency of its stores to keep up with the demand. Read on for details of Chipotle's digitally enabled future, and what it could mean for customers, stores, and potential growth for the company. In a February press release, Chipotle announced "smarter pickup times," allowing customers who order digitally to get "shorter and more accurate" pickup windows. Curt Garner, Chipotle's chief information officer, described the technology enhancement to "keep our restaurants from being overwhelmed with digital orders, particularly at peak times." While management is excited, some customers are experiencing issues, including some of my Motley Fool colleagues and I. Adam Levine-Weinberg wrote that using the mobile app to order and pick up was "one of the worst experiences" he's had at Chipotle while Rick Munarriz wrote that the popularity of online ordering is slowing down the process for other customers. I've seen these issues firsthand: Recently, I went to my local Chipotle to pick up an order I placed online. There were several customers waiting for their pickup orders to be ready, a sea of paper order tickets on the separate assembly line for digital orderes, and a couple of very busy employees trying to manage the high volume of online orders. This is not the future state of digital ordering and technology that Ells described in last year's third-quarter earnings call when he laid out plans to make "digital ordering more appealing to our customers," and he finished the sentence with "... and more efficient for our restaurants." This is an important point for investors, and hungry customers, to understand. Chipotle's customers have had mobile online-ordering capability since 2009, and the ability to order via a web browser for even longer, but the orders have been made much the same way since the second "make line" was put in place. Currently, online orders are printed on register paper and given to the second make line, which is a more compact line behind the main line. Ells described a key planned efficiency change in Q3 last year: Paper tickets would be replaced with an "advanced queuing system that takes advantage of a heads-up digital display." This system sorts and breaks down the order data and presents it in an efficient way, so that the crew can assemble orders easily "with reduced errors and more consistent portion sizes." On the Q3 call, Ells admitted the stores were "struggling to make the food on the second make line with a little piece of paper with a lot of abbreviation," but didn't indicate how long this rollout would take. He went on to say that this new technology would be added selectively to some of the highest-volume markets. While no updates on rollout timing were discussed on the two conference calls since, the company has high aspirations for its digitally enabled line. Chipotle is taking a three-pronged approach to making its digital-ordering future a reality. First, Ells said in the most recent conference call that marketing efforts remain a priority. Second, Garner said on the conference call that a "wholesale rewrite" of the mobile app is on the roadmap for 2017 to match improvements that have been made on the website. Third, a push to enhance store efficiency will be part of Scott Boatwright's job in the newly announced position of chief restaurant officer. When these technology announcements were made in October 2016, Ells said that the second make line could make up as much as 50% of the sales for some locations, with "digital orders from all sources, including catering and delivery services." While investors should be excited about a future where 50% of the sales are digitally enabled, Chipotle still has a lot to do to make this happen.